Even if you don’t end up putting grandma on a hoverboard, this Christmas Eve is set to be the weirdest in recent memory. No jacket required for much of the normally frigid East Coast, while the West Coast freezes its usually balmy buns off? Here’s a look at the meteorological surreality of the December 24 forecast. First, let’s recap. June was the hottest June on record. July was the hottest July on record. August was the hottest August on record. September was the hottest September on record. October was the hottest October on record. November was the hottest November on record. The month’s not over yet, but in all likelihood, December will be the hottest December on record. And even if it’s not (which it will be), this week in particular is one for the record books, delivering the warmest Christmas Eve ever for much of the country. A jet stream shoved way north due to warm ocean temps—yes, El Niño-related, but not technically El Niño, yet—has created this weather pattern, nicknamed the Blowtorch. (They could have come up with a much more Christmasy name than that. Chestnut Roaster?) This means the US is essentially split into two very different weather stories. The West Coast is cold (although not record-breakingly cold), while the Eastern half of the country is getting blasted with record-breaking heat. How hot are we talking? “At least 90 of the 236 weather-observing sites in the Lower 48 states will be within three degrees of a daily record high for December 24,” according to Weather.com. 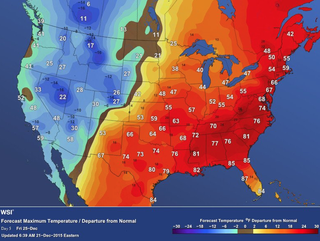 That’s 25 states that will likely see their warmest Christmases ever. Here’s what that looks like. Boston, New York City, Buffalo, Philadelphia, Washington DC, Atlanta, Raleigh, Tampa, Cleveland, Houston, Orlando... the list goes on and on and on. Many of those cities will break those records at 12:00 a.m. This is the craziest part. Not only are all those cities breaking their temperature records, they’re shattering them: Some of the low temperatures will be higher than the record high. That means most of these places will break the record the minute the clock strikes midnight. And it will only get warmer from there. For example, in Boston, it only needs to hit 61 to break the record. The high is forecasted to be 67. Just to show you one of the most dramatic East Coast-West Coast comparisons, let’s look at NYC vs. LA. New York City is already seeing one of the largest temperature anomalies on the East Coast: The forecasted low of 59 is higher than the record high of 56 set on Christmas Eve of 1988. Here’s the biggest head scratcher. For at least a few cities, December 24 might bring temperatures higher than the ones recorded on July 4. What! This one is a might: On July 4, 2015, New York City recorded a high of 75 degrees. The forecasted high for Christmas Eve is 72 or 73... it’s a bit of a stretch, but not completely unlikely. It’s like Christmas in July, but July in Christmas. This is the not-so-fun part. With warm unstable weather comes the chance for severe storms. This week, the Midwest and parts of the Southeast are seeing a higher than normal chance of tornadoes. You know, the kinds of things you usually see in summer. The risk for tornadoes is relatively high but this part of the forecast came true a day early: A tornado watch was issued for several states on December 23, and a series of large tornadoes have been spotted in Tennessee and Mississippi.